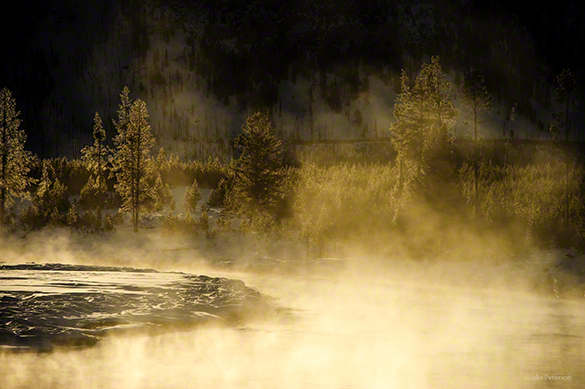 Steam is one of the best parts of winter landscape photography. It adds so much drama and character to the images that the landscapes can take on a whole different life form. If you don’t believe me then find a good spot in winter, take a picture and then go back in the summer and you will see the awesome difference. But how do you protect your camera gear while working in that steam? First off this is for those that are standing in steam while also photographing it. If you’re a good distance away then your gear really isn’t in any danger. With that when you are standing next to a steam pocket remember that the external surfaces of the cameras are quite resilient. It is the internal electronics that aren’t, so don’t change lenses, or cards or batteries while standing in steam. Next carry a towel with you to gently dab off any moisture that gets on the surfaces, especially by the buttons. Lastly be careful with the front element and what I mean is that steam is hot but the air around the steam is not so if you stick that lens into the steam and it gets hot and then you quickly move somewhere else where it is cool then that difference in temperature can cause damage. Instead try covering the front element afterward and then move. Let it be a little more gradual temperature change. I highly recommend NC Filters for these kind of shoots because if you damage a filter it’s no big deal where as a front element is. Don’t be afraid of nature just be aware of what can happen and be prepared.